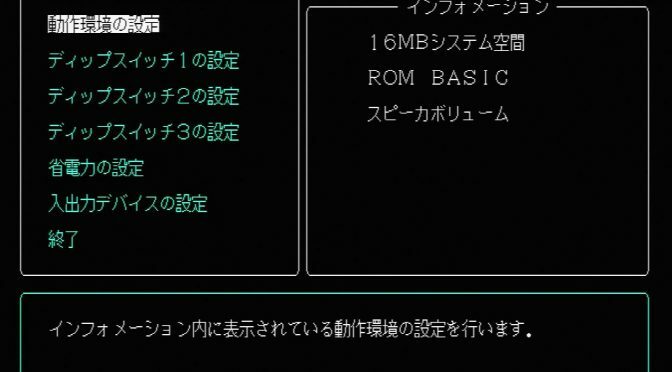 Changing settings in the BIOS of a japanese computer can be dangerous if you don’t have any knowledge of the japanese language or don’t what you’re doing. I don’t have that much knowledge of the language either and tried to translate the BIOS. This is how I did it: I connected my PC-9821Xe10 with a sync combiner to the Framemeister and grabbed a video of the selection of each and every BIOS menu item. Then I converted the frames of the video to image files. The images were then cropped and converted into grayscale negatives to be processed by an OCR engine. Most of the output was gibberish and every single line of text needed manual processing. The japanese text was then fed into the Bing and Google translators and some common sense added to the output.